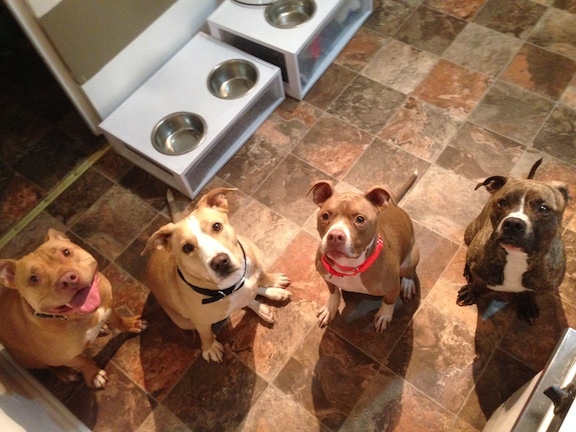 Boy did I get a work out with this pack of Pits (from left) Ruckus, Pebbles, Bam Bam and Booger. When it comes to high energy dogs I have worked with, these dogs take the top spot. When I first arrived it was almost as if waves of Pitbulls were washing over me; running around, jumping up and spinning in circles wheel barking excitedly. Their owner had called me concerned about Bam Bam’s occasional growling at their owners baby and while that is something to take note of, it was obvious that over-excitement was the number one issue with these dogs. I waited for a few moments to see if the excitement level would drop. When it became clear that the door excitement was in fact more of a typical behavior, I knew we were in for an extended session. Whenever I am dealing with multiple dogs and the energy level is high, I try to identify which dog is the highest energy or the most unbalanced. It only took a few moments to see that Bam Bam and Ruckus were the two most excitable, followed by Booger. Pebbles, the lone female in the group, was by far the calmest with a nice pleasing energy to her. I asked if we could place a few of the dogs in their kennels so we could get down to a more reasonable energy level. Their owner explained that all the dogs had kennels except for Booger as he refused to stay in a kennel. I decided that would be a great place to start so started to go upstairs with Booger. But as soon as the door the the stairs was opened, Booger raced past his owner, almost knocking her down. Whenever I am working with a client who has over excited dogs, I look for any activity or ritual the dog engages in that gets it excited. This provides us with an opportunity to practice stopping or pausing until the dog returns to a calm balanced state of mind. Rushing up the stairs was a golden opportunity to start this practice. I called his owner back to the bottom of the stairs and showed her how to claim the entrance to the steps. We started off small, with her back to the stairs so she was facing the dog. She waited until he was still, then I had her take one step backwards (towards the stairs) keeping her front to the dog. As soon as she moved, the dog started to come forward. To disagree with this, I had her reverse her motion and walk directly at the dog. As soon as she did this he stopped in his tracks. I had her wait a second to make sure he was staying put before taking another backwards step up onto the first stair. This time the dog stayed in place so she took another step. When the dog moved forward she moved towards him again to reset his position. We repeated this back and forth movement for about 10 minutes until she was able to make it up the stairs while the dog waited. I suggested that she practice this exercise with each of their dogs individually until they automatically stopped at the top or bottom of the stairs before being called. By the time we got to the top of the stairs with the dog, Booger was calm and kept looking towards his owner. This is a great sign and an action I wanted to instill int he dogs. To gauge his fear of the kennel I tossed a few high value treats inside. Surprisingly, he went right in. I tossed in a few additional treats one at a time to be sure, then I showed his owner my technique to change the dog’s perception of the kennel. For dogs with Separation Anxiety (which is the case with Booger), placing them in a kennel before leaving can trigger panic attack. This panic state causes the dog to look at the kennel as a negative as its something that is keeping the dog from reuniting with its owner. To change the dog’s perception of the kennel I like to practice communicating that the dog has to stay inside the kennel with the door wide open. Because there is no barrier to prevent the dog from exciting, it has to restrain itself. Additionally the owner is only a few feet away which helps the dog relax. By removing both triggers from the equation (owner out of sight and kennel door locked), we can help the dog practice being calm inside of the kennel. It only took about 5 minutes before Booger was laying down inside the kennel with the door wide open while remaining inside in a calm manner. As soon as this was the case I gave the dog a recall command then rewarded him with some well earned attention. I had his owner repeat the exercise and she was able to get the same result her first time. I went over how to progress the exercise so that in time, Booger learns to stay completely calm in the kennel. So far I have had a 100% success rate in reconditioning the dogs to like being in their kennel. Most of my clients report that within a few weeks, the dog goes in and hangs out in the kennel on its own. This is exactly what we want. A dog’s kennel needs to be a safe place that the dog can go to when it needs to chill or relax. On our way down the stairs, his owner practiced the waiting exercise until she was able to get all the way down the stairs while Booger waited at the top for her to call him down. When we returned to the living room, the other three dogs were much calmer. I kept an eye on them and offered a few corrections to both Bam Bam and Ruckus when they started to get wound up. Its far easier to snap a dog out of it or disagree with excitement when you catch it at the jump. I showed their owners some signs to watch for and then went over some non verbal communication methods to employ. Humans often add excitement to a situation by the way they react or interact verbally. By using body language, movement and their eyes, their owners were able to get the dogs attention easier. Correcting them took longer than I liked so we spent a few minutes going over some new ways of interacting. I suggested that their owners stop petting the dogs when they pawed, barked or nosed them for attention. These dogs clearly saw themselves as equal to their owners in terms of rank or authority. Each time one of the dogs engaged in an action to get their humans to pet them, they were essentially giving an order; something a leader would do. When the human obliged the dog, they were reinforcing the dog’s perception that they can tell the humans what to do. To change this and start to redefine the leader follower dynamic, I had their owners counter the dog’s demand with a command of their own. We started out with Bam Bam who barked at me for the toy I was holding. Instead of giving it to him, I gave him a “sit” command in a stern voice. As soon as he sat down, I reached under his chin and scratched him, Petting a dog this way after it follows a command or correction can help instill a sense of pride in the dog for following the human’s lead. This is a great way to use positive reinforcement to change a dog’s behavior into something the human wants. While this technique had a positive impact on Bam Bam, Ruckus didn’t get the memo and jumped up on me to get the toy. The dogs had been jumping up on their owners so much that I think they had gotten somewhat used to it. I showed them the technique I had developed to stop dogs from jumping up by applying it to Ruckus. As soon as I did, Ruckus protested loudly, no doubt surprised by the rebuttal. We ended up applying the technique to all the dogs except Pebbles and by the end of the session, the dogs were starting to stop themselves before jumping up. After correcting Ruckus from jumping up, the baby got a little upset and started to cry. As soon as she did, Bam Bam got stiff, snapped her head to the side staring at the baby before starting to run towards her. As soon as I saw him get stiff, I made a loud sound to disagree with him. As soon as he gave me his eyes, I scratched him under his chin. One of the goals is to get the dog to stop fixating on any stimulation that they react to. Later in the session, the same scenario played out but this time Bam Bam did not give me his eyes and continued towards the baby. He wasn’t in a hunting mode or showing aggression, but you could see that he was reacting to the noise. From what I saw it looked like he wanted to disagree with the baby’s crying. His owner mentioned that he did this fairly often but also sometimes licked the baby. While licking another dog’s mouth can be a form of appeasement, that was not the situation in Bam Bam’s case. I suggested that his owners disagree with him any time he started to lick the child as well as how to institute a boundary that they dog needed to respect. I walked over and got between the baby and Bam Bam with my back to the baby. By keeping my front facing the dog with the baby behind me, I was communicating that Bam was to leave the area. Now Bam Bam’s actions were not at all aggressive, but due to the excitement that I had seen previously, its not unreasonable to think that he may nip to correct the baby if she cries out when he is excited. As their owners use rules, boundaries and structure to help the dogs learn that they are not in the running for the top spot in the home, these attempts to disagree with the baby’s behavior will diminish. Over time, this structure will also help the dogs learn that they need to remain in a calm state of mind. I went over a few exercises that will help the dogs learn to calm down and control themselves as well as some different ways to burn their excess energy. These are not super high energy dogs, so it shouldn’t take a ton of exercise to drain their excess energy. But even a small amount of excess energy can have a big impact when you have this many dogs. Because feeding time was a big thing that got the dogs over-excited, I went over a more structured way of feeding the dogs. I had their owner usher all of the dogs out of the kitchen where their bowls are kept before putting food in the bowls. As soon as the food came out, the dog’s energy level started to increase and a few of them crept past the boundary to the kitchen. I had they owner put down the food and immediately rush towards the doorway until the dogs retreated outside of the kitchen. He waited until the dogs were stationary before picking up the food cups and moving to where the dog’s food bowls were kept. I told him to keep his front to the doorway and dogs and to move in a deliberate manner. He had to stop and re-correct the dogs a handful of times before he was able to add food to all their bowls while the dogs waited at the doorway to the kitchen. Next I had his owners pull out some chips and lean against the counters away from the doorway. 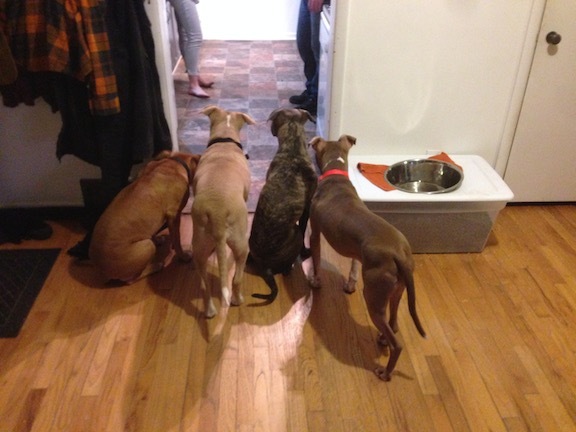 They spent a few moments snacking on the chips while the dogs remained outside of the kitchen watching intensely. By taking the time to establish the boundary, then snacking on some food before feeding the dogs, they were able to calm them down while assuming a leadership position. While the energy level was lower than most of the session, Ruckus and Bam were almost quivering. Booger was calmer than them but Pebbles was completely calm. Because of this and the fact that she had the energy level and manners that all the dogs could benefit from, I had their owner invite her to come in and eat first. When you have multiple excited dogs, feeding them together can trigger in increase in excitement and sometimes lead to fights. Some dogs eat faster thinking they will be able to go and get additional food from one of their room mate’s bowls. By establishing a respectable distance between the feeding dog and the rest, the dogs will start to develop more respect for their owners while calming down as their is no longer anything to be won by eating their food first. By feeding the calmest dogs first, we can reward the behavior we want. In time, the other dogs will start to figure it out and adopt a calmer demeanor at feeding time. The more their owners practice this, the better behaved and calmer the dogs will become. One by one their owners called the dogs into the kitchen and fed them. Surprisingly Bam Bam was not he last to eat. That distinction fell to Ruckus who was laying down for most of the wait, but still clearly ready to spring forward. Almost like a coiled spring. It took almost 5 hours, but by the end of the session, the dogs were far night and day calmer than when I first arrived. Their owners will have some work to do, But by stopping and waiting for the dogs to calm down before moving forward, the over excitement should diminish. When it does the dogs behavior and responsiveness will continue to increase. These are some smart dogs and their owners are committed to reestablishing order. There will be ups and downs, but I could see and feel some relief from their owners knowing that the calm balanced household they want is achievable.